I had a wonderful Easter Sunday. I spent the day with my family and extended family. I joined with many loved ones in singing hymns of joy and exultation at the wonderful news of Christ’s resurrection. Then we knelt as the emblems were blessed and we commemorated the sacrament of the Lord’s supper, as he asked his followers to do. As I ate bread, I thought of His body, not only laid down and sacrificed for all, but raised again in triumph over death and the grave. Because he lives, I will live also, and my children will live, and you will live. Rejoice! As I drank wine, I thought of his innocent blood, shed for all, and left on the ground as a testament of his suffering. His Spirit testified in abundance to those present, that on this most sacred day of remembrance and celebration, He would have us remember Him in the way He taught. And this shall ye always do to those who repent and are baptized in my name; and ye shall do it in remembrance of my blood, which I have shed for you, that ye may witness unto the Father that ye do always remember me. And if ye do always remember me ye shall have my Spirit to be with you. He did, indeed, send his Spirit to be with us. After partaking of the Lord’s Supper, I accompanied friends and family to living water, where I witnessed several baptisms unto our Lord. Coming up next on the agenda is a baby blessing, followed by a family dinner. I feel to rejoice and shout praises unto the Holy one of Israel! 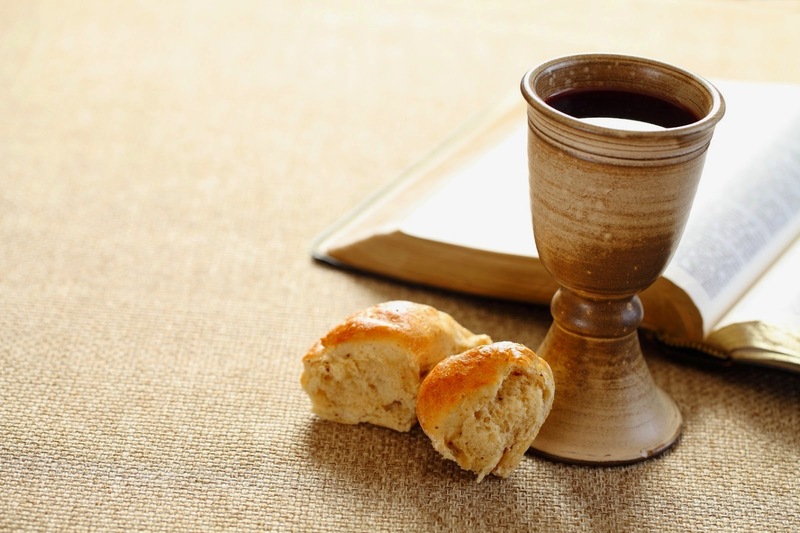 But back to the Lord’s supper: One thought to consider. There are two Sundays each year in which the entire membership of the LDS church is denied access to the sacrament. This year, Easter Sunday is one of those days. We are told, instead, to gather and listen to men solemnly telling us to follow them. This shall ye always do, indeed. Please don't take this as merely finding fault with the LDS leadership; that's not the point at all. Rather, the point is to stop and consider these things for yourself. What have you missed today by not commemorating His flesh and blood on this, of all days? What more might you have received? How might you have witnessed unto the Father that you do ALWAYS remember Him? I hope to cause some few to awaken and consider their situation. Having spent this Easter Sunday worshipping Him, and not men, I’m amazed at the difference between the two. It is a contrast that cannot be adequately explained, and must be experienced. It is joyful, holy, sanctifying and wonderful! His promise is real! He does send His Spirit! It comes in the way He taught—not by merely speaking about Him, but by experiencing Him through His Sacrament. We did the same as you. We had much to be grateful for as my son, who had just been sent home on Wednesday, early from his mission, blessed the sacrament for us. He was sent home because his presidenct told him he was apostate for being a believer in Denver snuffer's words. its a long story how they even found out, and it doesn't matter for this subject matter on this post. But back to Easter morning. I got up early to soak in the bathtub, because it is truly one of my favorite things to do. I get a lot of personal revelation in the bathub. There's something about water I think lol. Anyway, the spirit specifically told me that we needed to have the sacrament that morning and have a lesson on the resurrection and the atonement. Up until that point we'd never had the sacrament at home. But the spirit told me profoundly that it needed to be done. I asked my newly returned son to bless the sacrament. He was a little bit worried at first as he knew that was disobedient with what bishops specifically tell people lol, but he did as I asked and it turned out to be such a beautiful experience. Beautiful post. Thank You, Adrian. Sweet words to describe a blessed event. Thank you. I sincerely appreciate your kind sentiments and concern, which I believe you are expressing out of love. The church has made it clear that people like me are not welcome unless I am willing to pledge allegiance to a man, which I will not do. Christ is the one who has the power of salvation; not a man, not an organization. I will only follow Him, no matter the cost. I similarly appreciate your thoughts about my Father, but I am convinced he approves of the path I'm on. Following the Savior has born delightful fruit in my life, which I will not trade for any earthly blessing. Thank you for your post. The spirit has been whispering to me to do this in my home, but for the fear of men I have neglected it, and hope to be forgiven. Having not much experience with wine, are there any types of red wine that are more appropriate (or less appropriate) for this sacred ordinance? According to D&C 27:2, there is no wine that is more particularly approved than another. Being new to wine, I've found most of it very distasteful. A bitter cup indeed. Wine labeled "soft red" may be a little easier on your palate. Also, sometimes you can find red wine in single-serving bottles, which is great if you don't need a whole bottle, as wine doesn't keep well once opened.